Happy Friday everyone! (or Saturday if you are in the UK) I still haven’t cracked this blogging the day before something needs to be posted. lol Welcome to the little things that I love this week! It is no secret I am visiting home, a stunning location on the west coast of America where the sun and beautiful landscapes keep me from reading anything. I have tried my hardest to keep up with my blog reading and commenting but the river and pool keep calling my name. I promise I will be back in full force when I get home. Here are a few posts though that I caught a moment to enjoy this week! Dear Beautiful – A Walk Down Memory Lane: It had me almost in tears, always amazing when you can share great memories of your past with your little ones. Life With Munchers – Yellow Home Decor: I love her home decor posts. We seem to have similar taste and I can’t wait to see what she uses in her new house! Capture By Lucy – Pink Pool Party: By far the most extravagant pink party I have ever seen. She is so talented and creative. Write Like No One Is Watching – What Maisie Knew: She is so strong, brave, and empowering. I think she is doing an amazing job and her post is so full of emotion. While scrapbooking at night with my Momma in her amazing craft room, I have had HGTV on in the background. It’s a Home & Garden TV program and one of my favorites. I get so many tips, advice, and ideas off their for my own home. I can’t wait to get home and do some moving around and redecorating a bit. Shhh don’t tell Mr P! I had the chance to actual do some shopping with my childhood bestie R without our kids. I picked up a few new dresses, tops and accessories including this new skirt, necklace and these white sandals. Along side my bright blue pedicure from our spa day, it was all a perfect match. 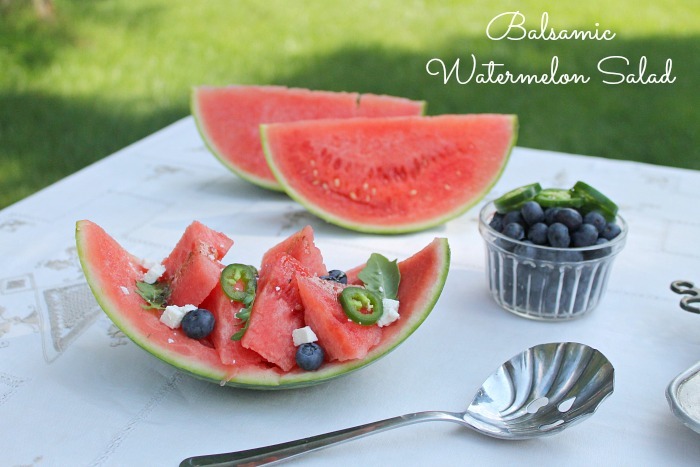 This week with the weather scorching hot, I made my family my yummy Balsamic Watermelon Salad. It was a huge hit even with the kids, and perfect for any bbq or party you are hosting. The flavors really do compliment each other even if they don’t sound like they do, I promise. How do you think I am getting on with my food photography? I have been making settings and using props all week to see where I can improve and what else I can create. I am ever so excited Mr P will be here tomorrow, to join us for two weeks on our vacation! I couldn’t be more excited which also means I am finally taking a week off from blogging. It will be the first time I have stepped back since I started almost a year ago. I think it’s important we have this whole next week together with our family and my extended family too. Share With Me will still be on Wednesday and you can still catch up with the LTM family on Instagram. I am sure my IG feed will be full of adventures! I hope you are all enjoying them thus far of our family vacation! Love Miranda Lambert. 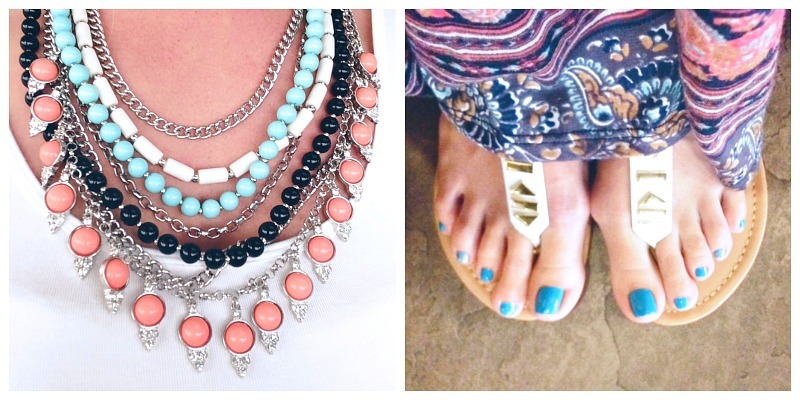 The necklace and sandals are great. Sounds like you are having a great time with your family. Enjoy your time off with your hubby. Thanks Emma. We are having an amazing time. Thank you so much. I can’t wait for Mr P to get here today. We are going to have the best family vacation ever. What a lovely post, your joy of being home comes through clearly and I will certainly be looking forward to trying the watermelon salad. Thanks Michelle. You must try the watermelon salad I was so impressed with how amazing the flavors tasted together the first time I made it and my family love it. Its amazing to be home. Wish I lived closer. haha Thanks Jo. I was excited my necklace matches my skirt I found at another store so perfectly.